Coming next to DanceHouse, we present Israel’s L-E-V November 14 & 15 at the Vancouver Playhouse. 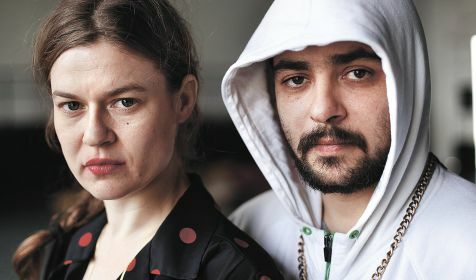 Since 2006, collaborators Sharon Eyal & Gai Behar have been a significant voice in the artistic community, creating a continuous stream of critically acclaimed original works for Batsheva and other eminent dance companies around the world. L-E-V is the culmination of years of momentum, choreographed by Sharon Eyal and Gai Behar, accompanied by the endlessly original music of Ori Lichtik, delivered by fiercely talented dancers that move with expressive precision. House, their latest work, shows off the synthesis of these high level collaborators with a unique sensibility. L-E-V (which means heart in Hebrew) feeds off of emerging technologies and integrates them effortlessly and unobtrusively into cross-disciplinary stagings that could be equally at home at a techno-club or opera house. L-E-V is the confluence of movement, music, lighting, fashion, art and technology—each uniquely expressive while emotionally entwined. The company describes itself as provocative, expressive, collaborative, rhythmic, liquid, and precise. That sensibility is obvious throughout its many collaborations with global dance companies, including Norway’s Carte Blanche, who performed Corps de Walk as part of DanceHouse’s 2012/13 season. Sharon Eyal was born in Jerusalem. She danced with the Batsheva Dance Company from 1990 until 2008 and began choreographing within the framework of the company’s Batsheva Dancers Create project. Eyal served as Associate Artistic Director of Batsheva between 2003-2004, and House Choreographer of the company between 2005-2012. In 2009 Eyal began creating pieces for other dance companies in the world: Killer Pig (2009) and Corps de Walk (2011) for Carte Blanche Dance of Norway; Too Beaucoup (2011) for Hubbard Street Dance Chicago, and Plafona (2012) for Tanzcompagnie Oldenburg, Germany. In 2013 Eyal launched L-E-V with her long-time collaborator Gai Behar. This October, they premiered Untitled Black in collaboration with the Goteborgs Operans Danskompani in Gothenburg, Sweden. Eyal is the recipient of numerous awards, including the 2004 Ministry of Culture Award for young dance creators and the 2009 Landau Prize for the Performing Arts in the dance category. In 2008, she was named a Chosen Artist of the Israel Cultural Excellence Foundation. Gai was a notorious mover and a shaker of Tel Aviv’s live music, art and nightlife scenes from 1999 till 2005. Gai joined Sharon in co-creating Bertolini in 2006 and has collaborated along with Ori Lichtik on the creation of Sharon Eyal’s choreographic works ever since. ~ by DanceHouse on October 29, 2014.